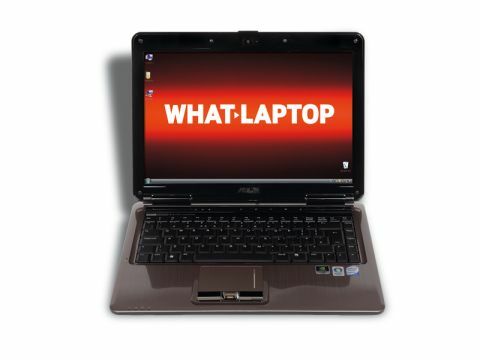 The Asus N80VC (£699 inc. VAT) is the second N-series laptop we've seen from the Taiwanese company – the ﬁrst being the N10. However, while the ﬁrst version was a small and compact netbook, this is a fully ﬂedged and fully specified laptop. You'll ﬁnd similar styling across the range, with glossy brown and black plastic used, and the overall effect is simple but attractive. With a 14.1-inch display, the N80 is a compact laptop, and its weight of 2.6kg makes it easy to carry around on a daily basis. The screen itself features a 1280 x 800-pixel resolution, so you'll be able to ﬁt several windows onscreen just as easily. The glossy ﬁnish did prove highly reﬂective in direct sunlight, but we didn't ﬁnd it to be an issue. The nVidia GeForce 9300M GS graphics card offers moderate performance. You'll be able to carry out everyday tasks with ease, and we had no trouble running presentations or editing photographs. You'll even be able to play older games in your spare time. The keyboard proved disappointing. The keys are large enough to type on with ease, but the board itself ﬂexes under pressure, and the keys rattled noisily. The touchpad was more pleasing, providing a friction-free surface that responded accurately to the touch. The chassis is more than up to the rigours of daily use, although a protective case is recommended to prevent the glossy plastics from damage in transit. We were impressed by how cool this machine remained, even after long periods of use, with the cooling fan also remaining quiet. Processing power comes from an Intel Core 2 Duo chip, backed by 3072MB of memory. It gives the N80 more than enough power for most uses, and we found it ran Vista Home Premium smoothly and without trouble. Battery life is merely average, at around three hours. Business users will ﬁnd plenty of space for storing ﬁles, with a 320GB hard drive in place. Connectivity is outstanding with ﬁve USB ports for plugging in your peripherals. You'll also ﬁnd VGA and HDMI interfaces, enabling an external display to be connected. Networking features are equally well speciﬁed, with the latest 802.11n Wi-Fi adapter and Gigabit Ethernet in place. We liked the Asus N80VC, and found it a portable, well-specified machine. It's let down severely by the keyboard, however, and there are far more comfortable and better machines to use.